A 17-year-old has been convicted of killing another teenager by stabbing him in the groin. 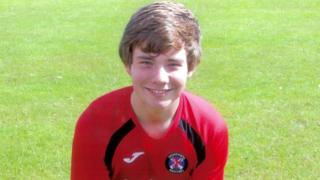 Luke Wallace, 16, suffered massive blood loss after his femoral artery was cut. He died in hospital eight days later. The stabbing happened in Baillieston, Glasgow, on 17 June last year. The convicted teenager, who cannot be named for legal reasons, was found guilty of culpable homicide. He had claimed he was acting in self defence. Luke's mother Angela Wallace, 49, told the High Court in Glasgow that just an hour before the stabbing she had texted her son asking where he was and telling him "be safe". She told the jury: "I know 100 per cent Luke would never carry a knife." The court heard that Luke and a friend, Josh McFall, 18, confronted the 17-year-old as he walked along the street hand-in-hand with a teenage girl. Mr McFall had a piece of wood in his hand and Luke had a lump of concrete, which he threw at the 17-year-old. The accused chased Luke, from Garrowhill, and stabbed him once with a knife at Glasgow Road, near Maxwell Avenue. He then ran away and told friends: "I've just stabbed someone." His hands, clothes and the knife were covered in Luke's blood, but his only concern was getting his bus ticket from a friend so he could get home. The teenager was also convicted of having a lock-back knife in his possession and attempting to defeat the ends of justice, by washing clothing he was wearing when he killed Luke. Giving evidence, the 17-year-old admitted stabbing Luke, who played for Drumchapel Amateur Football Club, but claimed he was acting in self defence. But, the jurors heard that when police had asked him if he acted in self defence, he just swore and shouted abuse at them. In his evidence he said he was terrified and had just "poked" Luke with the knife , which he found lying on a traffic island, in a bid to get away. The teenager was originally on trial accused of Luke's murder, but at the end of the Crown case prosecutor Jane Farquharson withdrew the murder charge and replaced it with the reduced charge of culpable homicide. Miss Farquharson said: "This case clearly and tragically illustrates the dangers of carrying knives. It is in the public interest that those who use and carry knives should pay for their actions. "The accused's claim of self defence is nothing more than a convenient smokescreen behind which he seeks to hide." Judge Lord Woolman deferred sentence until next month for background reports. The teenager was remanded in custody. Defence QC Mr Jackson will give his plea in mitigation then. In a highly unusual move, the accused tried unsuccessfully to have Luke's family and friends and other members of the public excluded from the court when he gave evidence. This demand was refused by Lord Woolman.